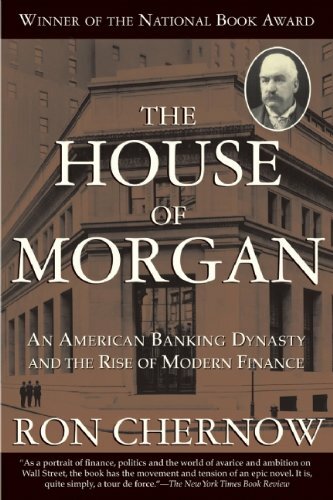 Published to critical acclaim twenty years ago, and now considered a classic, The House of Morgan is the most ambitious history ever written about American finance. It is a rich, panoramic story of four generations of Morgans and the powerful, secretive firms they spawned, ones that would transform the modern financial world. Tracing the trajectory of J. P. Morgan’s empire from its obscure beginnings in Victorian London to the financial crisis of 1987, acclaimed author Ron Chernow paints a fascinating portrait of the family’s private saga and the rarefied world of the American and British elite in which they moved–a world that included Charles Lindbergh, Henry Ford, Franklin Roosevelt, Nancy Astor, and Winston Churchill. A masterpiece of financial history–it was awarded the 1990 National Book Award for Nonfiction and selected by the Modern Library as one of the 100 Best Nonfiction Books of the Twentieth Century–The House of Morgan is a compelling account of a remarkable institution and the men who ran it, and an essential book for understanding the money and power behind the major historical events of the last 150 years.